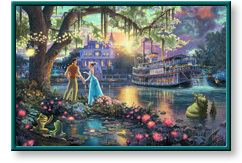 The Princess and the Frog and other artwork by artist Thomas Kinkade can be viewed in our artist slideshow. The Princess and the Frog by artist Thomas Kinkade and other Thomas Kincade art, art work, artwork, canvases, giclees, images, limited editions, open editions, paintings, paper, pictures, posters, and prints can all be found at Christ-Centered Art. you might say it all begins with a frog. The Princess and the Frog has been brought to life with hand-drawn animation techniques, making it the first Disney traditional animation classic in years as well as the first ever to be set in the enchanted city of New Orleans. "In my painting, I wanted to suggest the look of traditional animation yet maintain the sense of painterly mood that my work is known for. I lavished detail into the bayou flowers glowing with hidden fireflies, as well as the curving live oak draped with lacey Spanish moss. The characters of the movie swirl about the composition, inviting us to ponder the part each plays in the story. "The Princess and the Frog, the first piece in my Disney Discoveries Collection, will no doubt experience an enthusiastic welcome by Disney and Kinkade fans worldwide. At its core, The Princess and the Frog painting, like the movie itself, portrays a romantic love story. And who can resist a love story?" The Princess and the Frog by artist Thomas Kinkade as well as other open and limited edition inspirational paper art prints and canvases, giclees, images, lithographs, paintings, pictures, posters, and reproductions by renowned Lightpost Publishing, Media Arts, and The Thomas Kinkade Company artist Thomas Kincade can be viewed and purchased at special sale prices at Christ-Centered Art.